It looked like a scene from the movie "Independence Day" but was even scarier and was bigger on the radar. I came flying home as soon as I saw the lightning even though it was still ten miles away. Storms like this brew up almost every afternoon this time of year and can be very dangerous to boaters and fishermen, especially when you're whipping a nine foot graphite fly rod over your head. This is a short article I wrote for the summer edition of the Lee County Coaster. You can pick up a copy in just about every tackle shop in the area and a lot of other locations, too. It's a great resource, especially for it's tide charts. 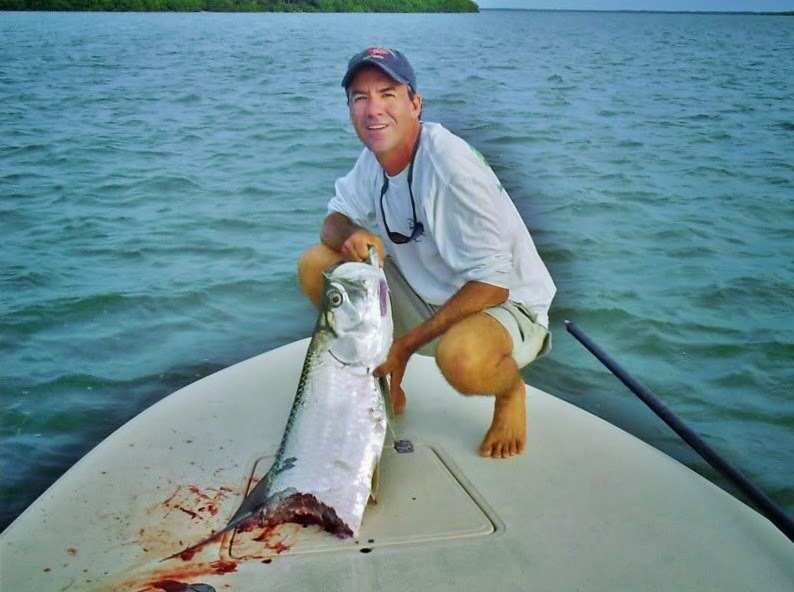 Summer on my boat is all about chasing tarpon, especially with the fly rod. Their annual migration brings them into our shallows sometimes as soon as March but early June through the end of August is prime time for silver kings in Southwest Florida. And while a lot of my anglers come here with visions of tangling with one of the 150 pound Charlotte Harbor monsters, it’s the fish that are only 1/10th that size that excite me the most these days. Baby tarpon, which are no more than 20 pounds or 40 inches long, might be the greatest thing you can catch on a fly. They’ll hit almost any pattern, spend the entire fight in the air, and can be boated in less than 5 minutes on an 8-weight rod. Best of all, these fish are commonly found in some of the most beautiful backcountry bays and mangrove creeks of Pine Island Sound and Matlacha Pass. For dedicated fly anglers, the hunt for these hidden schools of baby tarpon is half the fun. Some of us will spend hours examining both traditional navigation charts as well as Google Earth looking for likely habitats before we even step on our boats. The hunt will (and should) also involve a careful study of the tide tables like the ones that are printed in this book. Exploring the dense creeks that cut into the Pine Island shoreline is not that dangerous when compared to similar areas like those found in the Everglades but they still require a bit of caution, especially if you’re fishing from a small skiff or kayak. Strong currents are normal in these tight mangroves and during the new and full moons the water flow can easily overpower a paddle or electric motor. It can be a lot of fun to ride into these areas but no fun to fight your way back out, especially after sunset. And keep in mind that the predicted tides for the reporting stations in this book are just that: predictions. None of them are set in stone and weather and especially topography can affect them greatly. Take the Matlacha drawbridge chart as an example. When its posted low is 12 noon then the bottom of the tide at the back of Pine Island Creek, just a 15 minute run from that same bridge, usually happens almost an hour later. This information isn’t printed anywhere but serious backcountry anglers will figure it out just the same. That’s just one example for the endless shorelines of this area. So learn your tides and learn them well if you want to chase fish way up in the mangroves this summer. And while you’re at it, learn to love the smell of Deep Woods Off. That’ll really save your life back there. 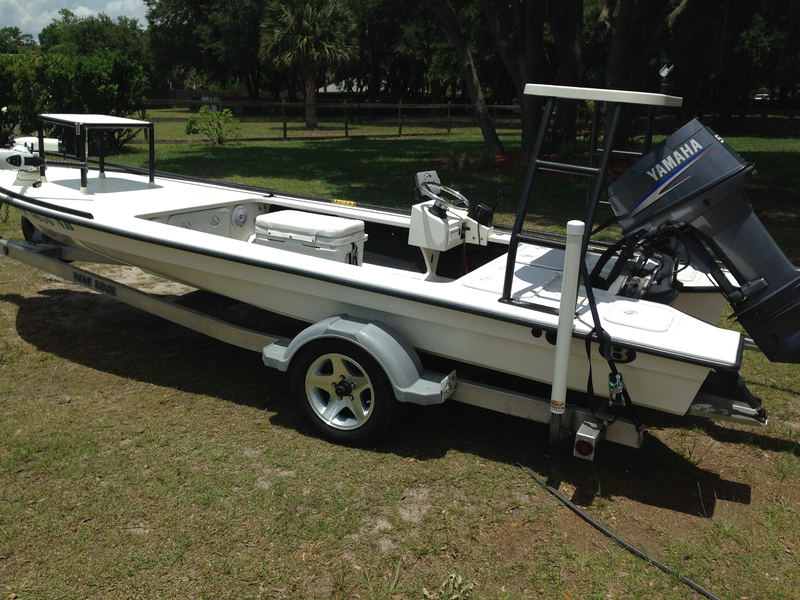 This is a fully custom skiff that's in flawless condition powered by an Etec 90 outboard with just under 300 hours. It has just about every option that the factory could rig and would cost over $45,000 brand new. The owners are moving up to an Aeon 23 later this summer and are asking $36,000 for their Vengeance. 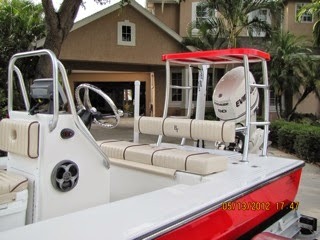 The boat is located in Bradenton, FL so give them a call at 941-749-6350. I got this shot when the light was still low and just after the tarpon spit the hook. If I wasn't fumbling to drop my push pole and grab the Nikon this could have been a great shot just a quarter second earlier when the fish was three feet higher in the air. This is also an example of why you should take your camera off its Auto setting. A higher shutter speed would have captured the spray in the air even better while reducing the blur and glare on the water's surface. Sometimes it's really tough to be both the guide and photographer at the same time. This is the go-to patterns for a lot of anglers this time of year and chances are you already have a few in your box. Here's an interesting article about how the Tarpon Toad was created from Saltwater Sportsman. 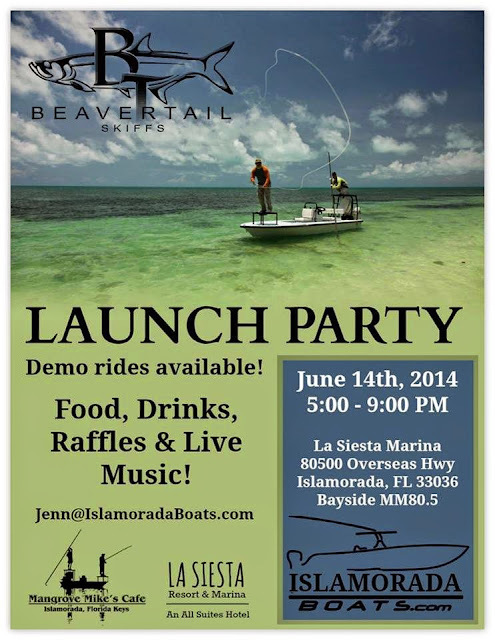 My friends Will and Liz at Beavertail just announced their first dealership in the Keys by partnering with Islamorada Boats located at mile marker 80 on US-1. Their kick off is this Saturday, the 14th and at the La Siesta Marina and these events are always a blast. Their latest skiff, the BT Elite, will be on hand for free demo rides. 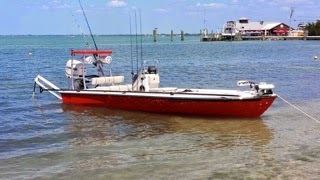 This boat is rapidly becoming the new favorite for a growing number of guides in the Keys who all have spent many years in rival skiffs such as Mavericks and Hell's Bays. If you're in the market for any new boat, stop by have a look. These boats don't come up for sale very often and this is a great example of one of the first Beavertails ever built. I'm a huge fan of the old Yamaha 50 which gives it the best combination of light weight, great performance and unbeatable reliability. 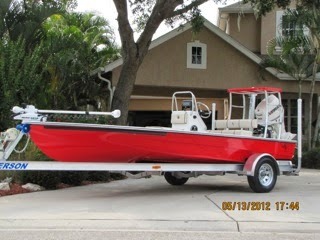 The seller has a new Beavertail Strike on order so click here for this boat's listing.